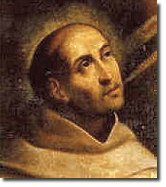 St. John of the Cross is one of the "big" patrons of the Carmelite order. Here is more information about him and ideas to celebrate his feast. St. John of the Cross was a prolific writer, his works include poetry and spiritual books including The Ascent of Mount Carmel, The Dark Night of the Soul, The Spiritual Canticle, and The Living Flame of Love. St. John reformed one of the oldest monastic orders. The Carmelites claim their roots back to the Old Testament and the Prophet Elijah, although it cannot be historically proven. December 14 is one of the principal feast days of the Discalced Carmelite Order, the Solemnity of their Holy Father John of the Cross, Priest and Doctor of the Church. Among the Church's contemplatives, St. John is one of the acknowledged masters of mystical theology. Indeed, perhaps no other writer has had greater influence on Catholic spirituality. Together with St. Teresa of Avila, he founded the Discalced Carmelites, an order devoted to service of the Blessed Mother through prayer and penance. Many great saints, other than John of the Cross have come from the Discalced Carmelites, such as Teresa of Avila, Therese of Liseiux. We also have the sacramental of the Brown Scapular from this religious order. Take some time today to read about the Carmelites and their contributions, perhaps begin a book by St. John of the Cross. For this day, try your hand at authentic Spanish recipes, such as gazpacho, a cold tomato soup. This is usually a summer dish, but if you can find good ripe tomatoes, the soup is good any time of year.